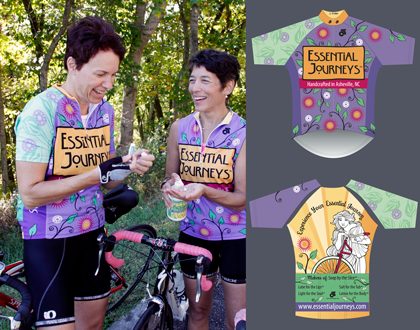 Left: Short sleeve and sleeveless examples of the Essential Journeys Bicycle Jersey. Photo by rebecca d’angelo, courtesy Essential Journeys. Right: Artwork layout as presented to manufacturer. Kimberly, owner of Essential Journeys, is an avid bicyclist. When she isn’t making her wonderful soaps she is usually out on the road with a group of friends riding around Asheville, or off leading a group of bicyclists on an Alaskan adventure. So to combine her two passions she asked me to design a bicycle jersey that would be fun, colorful and promote Essential Journeys. The base art was taken from label designs I had created for her lotion bottles. We used the same floral pattern on the front and one sleeve, with contrasting sleeve artwork on the other. The jerseys are offered in short sleeve and sleeveless options in cuts for both women and men. For information on ordering, visit Essential Journeys online shop: Bicycle section where you can order jerseys as well as matching arm warmers.